Third time lucky…! This is the third marriage for both the former UN under-secretary general as well as Sunanda. Finally after all that ho-hala Former Union Minister Shashi Tharoor ties the knot with Sunanda Pushkar. Wedding was held at his 200-year-old ancestral home in Elavanchery village at Palakkad district in Kerala on August 22, 2010 in a typical Malayali style. The marriage held in the presence of Tharoor’s 94-year-old grandmother Jayasankari Amma and other family elders. The invitation to the wedding on the eve of ‘Thiruvonam’ was limited to close relatives, friends and well-wishers. Tharoor’s twins Ishaan and Kanishk, both journalists born to his first wife was present. Sunanda’s son Siva from her second marriage, Sunanda’s father Col Pushkarnath Das and Tharoor’s sisters Sobha and Smitha and Rajya Sabha MP Mani Shankar Aiyar were among those present at the function. "I am sure her motherly presence will change our lives for the better, and I am happy to have a complete family," said Kanishk. "Ishan and I have a brother in Shiv." Ishan writes for the Time magazine from Hong Kong, and Kanishk edits Open Democracy, a magazine from London. Shiv studies in Dubai. This is the former UN diplomat’s third marriage. His first marriage was to Tilottama Mukherjee, an academic who he knew from school days in Kolkata. 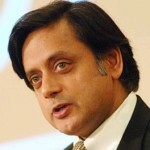 Tharoor recently divorced his second wife, Canadian Christa Giles. Sunanda Pushkar was earlier married to a fellow Kashmiri named Sanjay Raina. After the marriage ended in a divorce, she married a Kerala businessman Sujith Menon who died in a road accident in 1997. She has a 17-year-old son from her second marriage. Sunanda had grabbed headlines for alleged possession of a sweat equity stake worth Rs 70 crore in the controversial Kochi IPL franchise. The controversy, kicked off by IPL Commissioner Lalit Modi, had resulted in Tharoor’s resignation from the Union ministry.